CHICAGO – A federally funded phase III clinical trial shows that most women with hormone receptor-positive, HER2-negative, axillary node-negative early-stage breast cancer and a mid-range score on a 21-tumor gene expression assay (Oncotype DX® Breast Recurrence Score) do not need chemotherapy after surgery. The study found no improvement in disease-free survival when chemotherapy was added to hormone therapy in this group, which accounts for about two-thirds of women who participated in the trial. The findings will have an immediate impact on clinical practice, sparing thousands of women the side effects of chemotherapy. The study will be presented in ASCO’s Plenary Session, which features four studies deemed to have the greatest potential to impact patient care, out of the more than 5,800 abstracts featured as part of the 2018 American Society of Clinical Oncology (ASCO) Annual Meeting. This is the largest breast cancer treatment trial ever conducted, and the first precision medicine trial ever done, according to the authors. “Half of all breast cancers are hormone receptor-positive, HER2-negative, and axillary node-negative. Our study shows that chemotherapy may be avoided in about 70 percent of these women when its use is guided by the test, thus limiting chemotherapy to the 30 percent who we can predict will benefit from it,” said lead study author Joseph A. Sparano, MD, Associate Director for Clinical Research at the Albert Einstein Cancer Center and Montefiore Health System in New York, and Vice-Chair of the ECOG-ACRIN Cancer Research Group. “Before TAILORx, there was uncertainty about the best treatment for women with a mid-range score of 11-25 on the Oncotype DX Breast Recurrence Score test. The trial was designed to address this question, and provides a very definitive answer,” said Dr. Sparano. “Any woman with early-stage breast cancer 75 years or younger should have the test and discuss the results of TAILORx with her doctor to guide her decision regarding chemotherapy after surgery to prevent recurrence,” said Dr. Sparano. Based on evidence from several prior studies, the 21-gene expression assay is widely used to provide prognostic information about the risk of breast cancer recurrence within 10 years, and to predict which patients are most likely to derive a large benefit from chemotherapy. The test is performed on a tumor biopsy sample. Women with a low score (0-10) typically receive only hormone therapy and those with a high score (26-100) receive hormone therapy and chemotherapy. Side effects of chemotherapy for breast cancer can be significant. Short-term side effects that occur during chemotherapy include nausea, vomiting, hair loss, fatigue, and infection, and, in younger women, early menopause or infertility. Neuropathy is another common side effect, with symptoms including numbness, tingling, or pain in the hands and feet, which may sometimes be permanent. Certain delayed side effects that may occur months or years after chemotherapy are rare, but potentially serious, including heart failure and leukemia. The Trial Assigning IndividuaLized Options for TReatment (TAILORx) (ClinicalTrials.gov Identifier: NCT00310180) enrolled 10,273 women with hormone receptor-positive, HER2-negative, axillary node-negative breast cancer -- the most common type of breast cancer. Of those, 6,711 had a mid-range recurrence score of 11-25 and were randomly assigned to receive hormone therapy alone or hormone therapy and chemotherapy. The primary endpoint was disease-free survival, defined as recurrence of cancer in the breast, regional lymph nodes and/or distant organs, a second primary cancer in the opposite breast or another organ, or death from any cause. At a median follow-up of 7.5 years, the study met its primary pre-specified endpoint indicating that hormone therapy alone was not less effective than chemotherapy plus hormone therapy in women with a Breast Recurrence Score of 11-25. Nine-year rates were similar in the two treatment arms for disease-free survival (83.3% vs. 84.3%), distant recurrence (94.5% vs. 95.0%), and overall survival (93.9% vs. 93.8%), indicating no benefit from adding chemotherapy to hormone therapy. Another important finding was identification of the group that did have some chemotherapy benefit – women 50 years or younger who had a Breast Recurrence Score of 16-25. The researchers also found that women with a recurrence score of 10 or less had very low recurrence rates with hormone therapy alone, irrespective of age or other clinical factors. 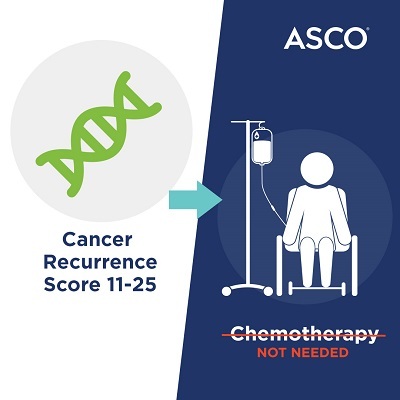 In addition, those with a recurrence score of 26 or higher had a distant recurrence rate of 13% despite chemotherapy and hormone therapy, indicating the need to develop more effective therapies for this group. This study received funding primarily from the National Cancer Institute, part of the National Institutes of Health. Additional support was provided by the Breast Cancer Research Foundation, Komen Foundation, and the U.S. Postal Service Breast Cancer Stamp. The ECOG-ACRIN Cancer Research Group designed and conducted the study.